Zetsche, pictured next to Mercedes' EQ electric car concept, has ditched his saggy suits and stiff ties for an ocean-blue blazer, skinny jeans and sneakers. MUNICH -- Daimler CEO Dieter Zetsche stood on a stage in 2011 surrounded by milestones of Mercedes-Benz's 125-year history. Dressed in a somber dark-grey suit with a light-blue tie knotted tightly at his neck, he tentatively directed attention to the brand's future with the revival of founder Gottlieb Daimler's claim, "The Best or Nothing." The gesture then appeared desperate. Mercedes's image was dowdy. Global deliveries had trailed archrival BMW since 2005 and were at the time dropping below Audi's. But fast forward five years -- the blink of an eye for an auto company -- and Daimler's flagship division has been reborn. In 2016, Mercedes retook the luxury-car crown from BMW for the first time in over a decade, as peppy new models like the GLA compact SUV wooed new, younger buyers and the S class was re-established as the benchmark luxury sedan. Zetsche himself appears rejuvenated. Embodying Mercedes's makeover, the 63-year-old has ditched his saggy suits and stiff ties for an ocean-blue blazer, skinny jeans and sneakers. But he's kept his trademark walrus mustache, as some things -- like the nameplate's three-pointed star -- are sacred. Over the past decade, Mercedes has elevated Zetsche to a de-facto brand, creating the likable Dr. Z character built around his academic title, thick German accent and sense of humor, featured regularly in advertisements and end-of-year memos on social media. Turning an engineer CEO into a marketing personality is unusual in Germany's stiff corporate culture and has helped soften the company's image. The spring in Zetsche's step doesn't stem just from the widower getting married again last year, but from proving doubters wrong. And with plans to keep up the pace with a slate of edgy electric cars, Mercedes looks set to defend the No. 1 ranking at least until Zetsche's current contract expires in 2019. 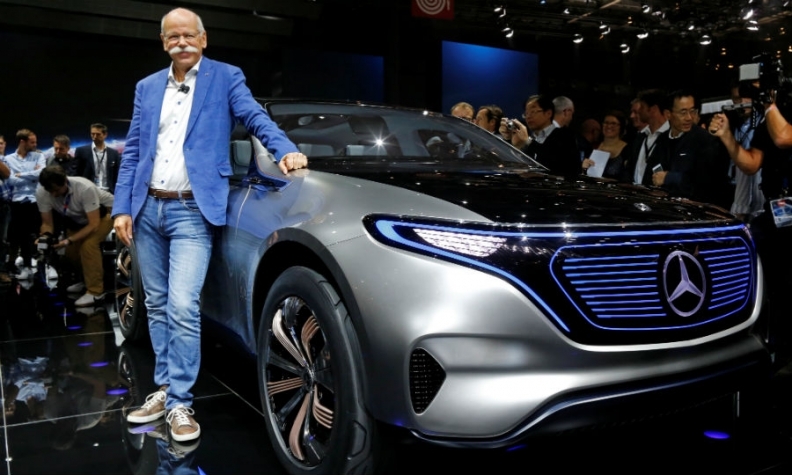 When asked by Automotive News Europe to name key factors in Mercedes' turnaround Zetsche said: "Probably the three most important elements I think are design, product portfolio and gaining a better understanding of China." Since the pieces started falling into place over the last couple years, Zetsche has "felt he can walk on water," said Stefan Bratzel, an auto industry researcher at the University of Applied Sciences in Bergisch Gladbach, Germany, and a former marketing manager at Daimler's Smart brand. "That's quite different to the irritable reactions when he was massively under pressure about why Daimler wasn't getting anywhere." Zetsche's turnaround is even more dramatic than he dreamed of back in 2011, toppling BMW as the luxury-car king four years earlier than his end-of-decade target. While the recovery has a lot to do with what the CEO's done right, including overhauling the brand's stodgy styling, it was helped by his rivals' stumbles. BMW's push into electric cars with the oddly shaped i3 in 2013 has fallen flat, and adding the seven-seat Gran Tourer minivan may have shifted the brand too far from its sporty roots. Also, CEO Harald Krueger, who took charge in 2015 and is 12 years younger than Zetsche, has yet to add fresh impetus, with BMW's revamped 5-Series sedan clinging to its predecessor's conservative design. Meanwhile, Audi has been slow to add to its SUV lineup to match offerings at Mercedes and BMW. And over the past year, the brand has been caught up in the emissions-cheating scandal of its parent Volkswagen Group. Audi's currently in the midst of finalizing a $1 billion settlement over tainted 3-liter diesel engines that it developed. Surging demand for updated SUVs including the GLC helped Mercedes deliveries jump 12 percent in the 11 months through November, more than double the pace of growth for BMW's namesake brand. Mercedes sold 1.9 million vehicles in the period, about 69,000 cars ahead of BMW, virtually guaranteeing the crown swap. Customers prefer Mercedes's newer lineup after the company overhauled most of its models in the past four years. By contrast, BMW's revamp cycle is just beginning. "2016 was indeed the year for Mercedes to harvest," said Arndt Ellinghorst, a London-based analyst with Evercore ISI. After learning from past mistakes, "they took risks and invested in new product, improved quality and innovation. As in life, success drives more success." While Zetsche's been able to reap the benefits of a well-timed product cycle, the task of keeping up the lead will fall to his successor. Daimler's already planning for the transition, grooming company veteran Ola Kaellenius -- now head of research and development, and chief of sales at Mercedes-Benz Cars -- for the position. Appointing the 47-year-old Swede as CEO would mark the first time a non-German takes the top spot at Daimler. Still, not everything's gone according to plan. There remain nagging questions about Mercedes vehicle emissions. U.S. regulators are probing the company, and environmental groups have questioned why there's such a large gap between the test results of Mercedes vehicles and what they emit on the road. Daimler has repeatedly said that its vehicles comply with applicable laws. Zetsche, who's been in charge of Daimler since 2006, has cajoled, prodded and provoked Mercedes through the turnaround. The process has seen bumps-- the supervisory board extended his contract by only three years in 2013 instead of the customary five -- and included tough decisions like cutting costs and selling Chrysler, which he used to run and had promoted in a series of TV ads that introduced the Dr. Z moniker. Those moves were aided by his easy-going public persona and an impeccable sense of timing, including unloading Chrysler just before the U.S. automaker's bankruptcy. One of Zetsche's first actions as Daimler chief was to summon about 1,500 top-level managers to tell them that about a third weren't needed as part of broader restructuring. Outlining the company's plans on a drawing board, he took off his jacket and rolled up his sleeves to signal he was hands-on and ready to make things happen. That was a marked departure from his aloof predecessor Juergen Schrempp, who sought to transform Daimler into a champion of globalization with auto operations spanning the U.S., Europe and Asia. Even after a decade as CEO, Zetsche has stayed on the front lines, running Mercedes as well as guiding the group, which is also the world's largest maker of heavy-duty trucks and buses.Â Amid Volkswagen's cheating scandal, his profile has continued to rise as he serves as the friendly face of the embattled German auto industry. That's included addressing hostile crowds, like in a speech to Germany's Green party in November. After a cool reception, he managed to win over the environmental activists with a mix of substance, such as underlining Daimler's commitment to electric vehicles, and self-deprecating humor, including reading a tweet in which he was disparagingly compared to U.S. President-elect Donald Trump. He takes the same approach to rallying the troops at Daimler. His 2016 year-in-review video is set in a non-nonsense cafeteria near Daimler's headquarters in Stuttgart. When he talks about the company's plans for introducing at least 10 electric cars, he acknowledges that the success won't come right away. "E-mobility is a bit like ketchup," he says, with a bemused look on his face as he pounds the bottom of a bottle. "One knows something's coming, but not when and how much," he adds before a large blob plops onto a plate of french fries.